Thanks to the Queereaders group on Goodreads, I came across this film which was said to be one of the best LGBT-themed films that a number of members had seen, and as it was cheap I thought "Well, why not?" Whilst I would love to say I agree with them, I simply haven't seen enough films with LGBT themes to really comment on it fairly. Natasha Lyonne stars as Megan, the titular cheerleader. She's seventeen, she's got a boyfriend and she's happy as she is, but is blissfully ignorant of two things. Firstly, that she's a lesbian. Secondly, that everyone else thinks she's one. Her parents and friends intervene with the help of an ex-gay by the name of Mike (Played by RuPaul), and she's sent to a corrective therapy camp called True Directions. It is there she meets Graham (Clea DuVall) and in a rather ironic fashion, falls in love and accepts who she truly is. The film is filled with a lot of subtle and less subtle imagery, both sexual and otherwise. At the camp, gender stereotypes are heavily involved, leading to rather hilarious scenes such as the boys flailing and flapping as they try to play American football or doing mechanical work on a car whilst a giant metal phallic structure created from a giant spanner and two hubcaps looms over them. The woman in charge of the camp is shown to be blind of her own son's sexuality, and it's clear from the start that most of the teens there will not be "corrected", at least not permanently. Whilst the film has a clearly feminine focus, or at least feel to it, there is a lot of comedy for the men too. Most of the jokes, both subtle and obvious, come from the male cast, whether it's one character dancing around in denim hot pants with a strimmer or Mike's struggle with his own homosexual desires (Both are quite strongly linked, actually). One of the male characters towards the end also teams up with Megan, and both get their happy endings. It could have easily been forgotten about, as things like that often are, but I felt adding it really made a difference. The camp itself, despite its exaggerated and humorous visuals, is sadly all too real and so are the attitudes in the film. Homosexuality is seen by many characters, including the teenagers in the camp, as wrong and unnatural, and something that can be corrected. They're threatened with losing their families and homes, with deliberately misleading propaganda. The psychology involved revolves around ignorance and almost Freudian thinking, for example the idea of Megan's father being unemployed emasculated him, meaning her mother became the breadwinner and as such it's a trigger that may have caused her to become gay. It's not all sunshine and lollipops, however. The characters, especially the males, relied way too heavily on stereotypes. All five males at the camp were at least moderately camp in their manner, the camp owner's son walked around in very short shorts and was obviously supposed to be gay, the two ex-ex-gays were also quite stereotypical in a way. There seemed to be no "normalisation", for want of a better term, so what representation there was of gay males it was based on stereotypes and exaggeration. To contrast, the girls were nicely varied. Megan was a cheerleader, Graham was slightly butch in a way, Sinead was a sort of goth (And hot! ), there was a very geeky girl and, well, I think you have to see the film for the fifth girl (Who might have actually been a transman, I'm not too sure). The acting and casting itself also seemed a bit shaky, and in my opinion the worst actors were in fact cast as the two main characters. DuVall held herself and acted in a way that never worked for me. She seemed too old or mature for the role, and I never bought her as a character. Lyonne also grated with me. It was her expressions, the things she said and how she said them, it seemed as if she just couldn't fully get into her character's shoes. The way they held themselves together, the way they acted around others, it seemed way too awkward and false, as if there was someone off screen holding their pay cheques above a naked flame. 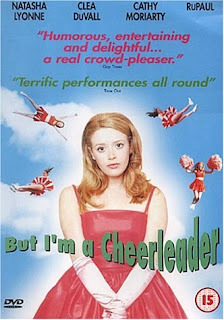 Overall, I think But I'm A Cheerleader was definitely a good watch, and a film I don't regret seeing, but I feel it could have been better and more representative whilst still retaining the humour and its message.